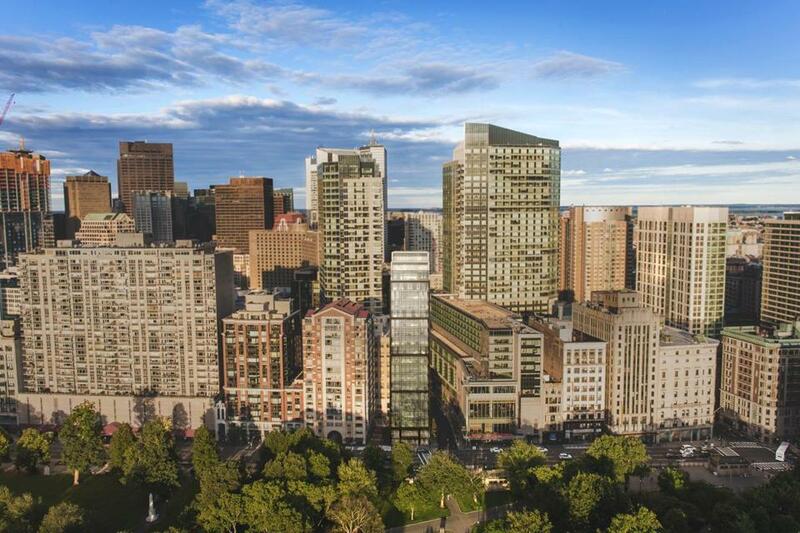 A rendering of the latest version of the narrow condo tower proposed for 171 Tremont St., overlooking Boston Common. The Swiss developer behind a proposed skinny tower on Tremont Street overlooking Boston Common has shaved off more floors from the building — again. Maurice Dabbah originally approached Boston officials with plans for a 355-foot tower, totaling 32 stories, at 171 Tremont St. Neighbors balked, and Dabbah’s team last year knocked the height back to 255 feet, and 20 stories. The Friends of the Public Garden complained publicly in January about the project, citing a 1990 state law aimed at limiting shadows cast on the Common from new buildings. So Dabbah lowered the tower again, to 235 feet and 19 stories, according to figures provided by O’Neill and Associates, a Boston public affairs firm representing Dabbah. The width of the tower remains at 50 feet. Michael Sherry, a director at O’Neill, said Dabbah expects to file a revised proposal with the Boston Redevelopment Authority later in April. Ross Cameron, a senior associate at Elkus Manfredi, the architectural firm that designed the building, said the top floors on the revised design step back from the street, much like a small staircase, to curb the effects of shadows on the city’s oldest park. The tower is unusual in Boston in that each condo unit would take up an entire floor, about 3,000 square feet of living space. The latest plans include a two-story penthouse unit, so the entire project would consist of 17 condos and a floor for the entrance lobby. The site — now home to a sales center for nearby Millennium Place — essentially covers one-tenth of an acre. The entire 69,000-square-foot project, next to the AMC Loews Boston Common cinema complex, would cost about $90 million, Sherry said. Dabbah’s firm needs city officials’ approval to waive the height limit of 155 feet for the site, although a number of nearby buildings already exceed that threshold. O’Neill is orchestrating neighborhood meetings, with a goal of winning over local groups. The first of those victories was Chinatown Main Street, a nonprofit that endorsed the project on March 17. Rick Wong, the group’s president, wrote a glowing letter, saying the project will increase the number of shoppers in the area, beautify the block, and bring jobs to the city. Meanwhile, the Midtown Cultural District Residents’ Association still hasn’t taken a position. Rishi Shukla, a cofounder of that association, said his group has invited the 171 Tremont team to present the revised plans to the association later this spring. The bigger issue, though, is the rapid pace of development in that part of the city. Another skinny tower — this one, 30 stories high — is proposed for the site of the former Felt nightclub, one block in from the Common on Washington Street. And two much taller residential towers are expected in Downtown Crossing a few blocks up Washington Street: the 60-story Millennium Tower that’s scheduled to open later this year, and a 59-story skyscraper planned at One Bromfield. Shukla sees the massive investment taking place in his neighborhood as a plus, for the most part, and he wouldn’t necessarily recommend slowing the pace down. But he also said city officials should update their master plan for the area, which is more than two decades old. Waiting for the city’s new overall master plan, known as “Imagine Boston 2030,” to be written would take too long, Shukla said. In particular, he said, city officials should consider how traffic flow may change with all of the area’s proposed developments in mind.